Xcel Energy recently launched their Community Solar Garden program. SGI is seeking subscribers for your local community solar arrays in Colorado. As a subscriber, you can go solar, save money on your electricity bill, pay no maintenance fees, and help provide clean renewable energy to your community. A limited number of "early bird" subscribers will receive a discount price, if your two-step application process is complete by September 13. You must get your electric bill from XCEL Energy. Rural electric customers are not eligible for this particular program, but may be eligible for other programs with your local utility. The Solar Gardens Institute (SGI) provides public education and policy support promoting solar gardens and community-supported energy. SGI has formed key partnerships with developers and financiers to bring local, renewable solar energy to you. A solar garden is perfect for anyone with a shaded roof, renters, and anyone who lives in an apartment or condominium. You will receive additional information and instructions. With the potential to incorporate a mix of clean, renewable energy sources and reliably supply electrical power to communities and businesses, microgrids figure big in modernization of the US power infrastructure. Looking to pave the way forward, the US Dept. of Energy's National Renewable Energy Laboratory (NREL) is anticipating completion of a new microgrid testing facility, the Energy Systems Integration Facility (ESIF) later this year. Just days after the historic blackout reminded us that centralized coal is the problem, not the solution to India's energy woes, a new era of entrepreneurs marked the beginning of a truly revolutionary effort to deliver energy access. The landmark deal that marked their arrival was of course lost amidst the coverage of the blackout and the continued death spiral the coal sector finds itself in. Nonetheless, the deal between OMC Power, and Bharti Infratel (India's largest mobile phone provider) to provide clean renewable energy to its off grid cell phone towers was indeed historic. It marks the arrival of Community Power and it couldn't have come a moment too soon. If you'd like to use electricity from rooftop solar but you don't own a rooftop to put it on, the California Assembly will soon be deciding whether or not to help you. On Monday, August 27 the Assembly is scheduled to vote on SB 843, which would allow renters, low-income Californians and others who can't install solar panels on their own property to buy shares in offsite solar facilities of up to 20 megawatts in size, and share in the proceeds from power sales to utilities. SB 843, if enacted, would create the Community-Based Renewable Energy Self-Generation Program in which retail utility customers could offset up to 100% of their utility bills by buying shares in a shared facility -- often referred to as a "solar garden." The state's Senate passed the bill in 2011. Its author is State Senator Lois Wolk; the bill was introduced in the Assembly by Members Huffman and Skinner. It may be a record for selling out in the solar incentive space. Within the first 30 minutes of Xcel Energy in Colorado opening its Solar*Reward Community Solar Garden standard offer to project developers, it was sold out. It's the first time that Xcel has offered incentives for community solar gardens. Community solar gardens are centrally located, but parts of which are purchased individually by residents or businesses that may not want to or be able to install solar at their location. Through the program Xcel is offering production incentives for the installations, which will benefit those who choose to buy in to a solar garden. A consortium of community-based companies will build, manage, and finance two subscription model solar arrays in Colorado. Each array will have 497 kilowatts of capacity, enough to power over 100 subscribing households. The solar photovoltaic (PV) developments will be available to all Xcel Energy customers under the Solar*Rewards Community program. According to an Xcel Energy press release, on opening day (August 15, 2012) the program was fully subscribed within 30 minutes. Governor Bill Ritter signed the Community Solar Gardens Act into law on June 5, 2010. In July 2012, the Colorado Public Utilities Commission approved rules allowing Xcel Energy Solar*Rewards to open the program. Like a community garden allows people without their own gardens to grow plants, a solar garden allows people who don’t have a good space for solar panels to subscribe to a shared solar array. Subscribers receive credits on their monthly Xcel bills, similar to the credit for a rooftop solar array. Residents, businesses, nonprofits, faith communities, and local governments can become subscribers and realize a savings on their electric bills. "The heart of the Community Solar Garden concept provides access to clean, affordable energy to many people that are currently restricted from the market. We cannot imagine a better philosophical fit than this program with Namasté Solar's triple-bottom-line (people, planet, profit) and employee-ownership business model. We are very committed to working with other like-minded groups in order to bring these projects to fruition. We are excited to add this new chapter of Community Solar Gardens to Namasté Solar's story of holistic business." stated Stanci March, Commercial Project Developer and co-owner of Namasté Solar. In 2010, the City of Aurora hosted a meeting of 70 members of an ad-hoc solar gardens working group to discuss the PUC rulemaking process and to explore securities and tax questions. City officials later toured the development’s chosen site and were present at a lease signing ceremony at Aurora City Hall. Aurora Solar Garden One will be located just southeast of Denver International Airport on retired farmland. Xcel Energy customers throughout the City of Aurora and throughout Adams County may participate. Saguache (“sa-WATCH”) is a town of about 600 residents in the San Luis Valley of southern Colorado. While over 20% of the county’s residents live below the poverty line, the region is blessed by the state’s most abundant sunshine. Residents are excited about the economic potential of solar development and are concerned about preserving the area’s natural and historic character. In 2008, a group of residents in the Town of Saguache formed the Saguache Alliance for Green Energy (SAGE) under the auspices of the nonprofit Saguache County Sustainable Environment and Economic Development (ScSEED). The solar garden will be hosted at Mountain Valley Lumber just south of town. Any Xcel Energy customers in Saguache, Chaffee, Alamosa, Rio Grande, Mineral, and Hinsdale counties may subscribe to Saguache Solar Garden One. SOLAR POWER FINANCIAL: Solar Power Financial is owned and managed by Barry Ruby who has been a real estate developer and investor for more than 45 years. Todd Stewart is a partner in SPF projects and is its business development director. Three times as many applications as capacity available for XCEL's Solar*Rewards Community program. Community Shared Solar comes roaring in! Xcel Energy faced a solar garden rush Wednesday morning when it opened its new program at 8 a.m. Within 30 minutes it had three times as many applications as it could fill. Joy Hughes, founder of the Solar Garden Institute and the for-profit spin-off Solar Panel Hosting Co., said she had five applications in by 8:05 a.m.
"It was a hectic morning," Hughes said. Solar Panel Hosting is working with three other developers on projects in Jefferson, Boulder and Saguache counties and Fairplay and Aurora. 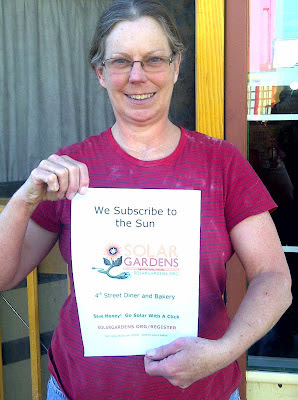 Great article from Ecopolitology on solar gardens (also called "community shared solar")! Shading, ownership issues, limited space and many other factors means that most American households simply aren't suitable for solar panels. The National Renewable Energy Laboratory estimated that as much as three-quarters of residential buildings have physical restrictions to going solar. However, in the last few years, new creative models such as "solar gardens" have started appearing all over the country, enabling those who otherwise were ineligible for solar, to participate in going green. What exactly is a community solar garden and how "big" will these become in the future? XCEL Energy opened Solar*Rewards Community (solar gardens), the first competitve community shared solar program. Solar developers made a mad dash to get their money in to reserve their projects first. At solargardens.org "mission control" we assisted developers with community projects around the state. Good luck to everyone! A new era in community solar history has begun. The Solar Gardens Institute is always willing to assist potential subscribers in solar gardens everywhere, community groups interested in solar garden development, and developers interested in community solar arrays. While photovoltaic generated electricity remains controversial politically in some parts of the world, for the territory of Tokelau, it will provide a cost-effective and environmentally sound solution for the entire territory in the coming months. Tokelau comprises of three atolls in the South Pacific. Photovoltaic arrays have currently been installed to one island and the installation of another two photovoltaic systems will be complete by October. 4032 modules, 392 inverters and 1344 batteries will provide electricity supply for the island. The first system on the atoll Fakaofo will be switched on in two weeks. California lawmakers passed a bill in late 2010 that fell short of requiring utilities to invest in energy storage but did give the California Public Utilities Commission the task of looking into whether a mandate is a good idea and what that mandate should be. The commission on Thursday approved a proposal that identified 20 ways that electricity storage could benefit the grid and consumers. That decision then kicked off a new round of discussion that could eventually lead to an energy storage mandate and turn California into a prime market for many types of battery and other storage technologies. The world's largest solar plant on water went into operation on Tuesday, paving the way for the commercialization of a new solar energy provider, said Korea Water Resources Corp., or K-water. The state-run water service company organized the three-year project in August 2008, and Korean industrial solutions firm LSIS undertook the plant construction in 2011 on Hapcheon Dam in Hapcheon, South Gyeongsang Province. Even in the mad-dash world of New Jersey real estate there is one kind of site no one will touch: a formerly toxic waste dump next to a prison. But on Tuesday, a remediated 6-acre lot that was once home to a gas manufacturing plant was host to an unusual development. Gov. Chris Christie and officials from site owner Public Service Electric and Gas Company (PSE&G) attended the groundbreaking of a new solar farm that should eventually provide enough power for more than 200 homes.